Almost all mobile device manufactures are coming with their own internet devices. The trend started with Archos and JooJoo tablets, later the segment got much attention when Apple released iPad. Research In Motion (RIM) also joined the league, today by announcing new tablet device called BlackBerry Playbook -at the BlackBerry DevCon 2010. Blackberry Playbook will be powered by a new OS BlackBerry Tablet OS and a dual-core ARM CPU. BlackBerry Tablet OS is based on the UNIX operating system QNX. RIM’s move to the QNX platform is not surprising. Microsoft, Nokia and a few other companies are also in the process of redesigning their smartphone OS to meet the demands of new generation customers. As per RIM, PlayBook is an ultra portable handheld made for professionals and young businessmen. BlackBerry PlayBook is probably the first web tablet to get a dual core processor and an OS that takes the full advantage of it. Similar to the Windows CE, QNX is a real-time operating system. The mobile optimized version of QNX along with features like 1GB RAM and 1GHZ ARM processor makes the BlackBerry PlayBook one of the fastest web tablets available in the market. The QNX architecture has the multi-core support- so the BlackBerry PlayBook is a future ready device. The symmetric multiprocessing technology in BlackBerry Tablet OS would enable users to take the full advantage of the two processing cores. That’s why RIM calls the BlackBerry PlayBook as a device that provide true multi-tasking. 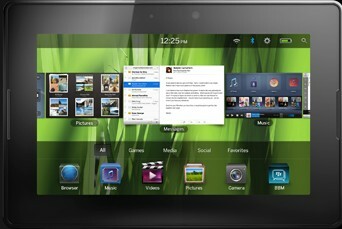 Take Samsung Galaxy Tab or Apple iPad, the specifications of Blackberry PlayBook is far better than them. The application count seems to be lower at this point, but the developer options announced today are much promising. The highly scalable BlackBerry Tablet OS platform helps users to deploy C and Java based applications on Blackberry Playbook. Apart from this, it also supports Open GL standards, Adobe Flash Mobile, Adobe Air Mobile, HTML 5 web apps and the new BlackBerry WebWorks app platform. RIM will launch Blackberry PlayBook Wi-Fi in US and Canada by the Q1 of 2011. RIM hasn’t announced the price of BlackBerry PlayBook tablet, but we believe that it would cost around $850. There would be a difference in price based on the storage options that are not yet announced. So if launched in India, Blackberry PlayBook would cost around 40000INR. We will update this page, as soon as we get more details on price plan and availability. Why do all tablets have such a huge border? Surely the screen real estate could be a larger area or the actual device be a lot physically smaller rather than have all that black edging. I cannot wait to until the 1GHz dual core processor is used in mobile phones, it’s only a matter of time now! The very best of all time ever made,newest school of technology for school.